Over the past month, it has been super fun working with my client Paul on his amazing house in Burbank. 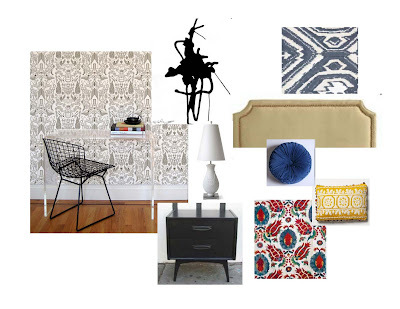 Right now, we are focused on making a comfortable and cool guest room for his many worldly guests. Here is a sneak peak of the inspiration and finds along the way. The actual headboard that we have chosen is a wingback made from a soft gray linen. We are going to be adding pops of brass hardware, which lend an air of Hollywood glamour. The nightstands are similar to the ones in the pictured in black, but they are vintage finds!!! I think the lightness of the base on this makes them perfect for his space. We are having them lacquered in black. See all the pics from the Santa Monica Flea Market outing on my Instagram. I love this black and white art collection that I found via Pinterest. Although, it may be a bit more modern than what we are going for, I think the prints and frames are perfect. More black and white good ness… I really just can’t get over how great the white bedding, charcoal gray wall, and the crystal clear lamps look with natural wood. I just love the simplicity. To see more of my Pinterest finds for this client click here. I know I’ve been teasing you all with the Guest Room pics that I have been working on. In fact, in a September post I released the inspiration board for this project. Well, alot has changed since then. The design has evolved into something far more sophisticated (as things do) and now our board includes a Lucite desk, black nightstand, and inkblot art. Annie found Kerry Cassil’s Fall 2009 collection of fabrics on the windows which really pulls out the blue in the suzani. 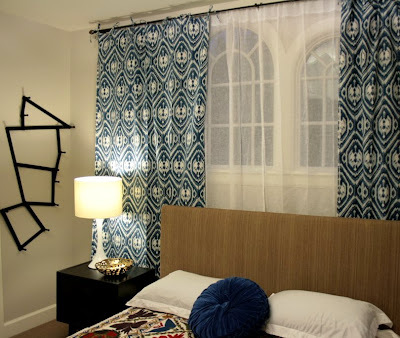 It was our second choice to Blue Chevron fabric or Ditto Blue from Madeline Weinrib. 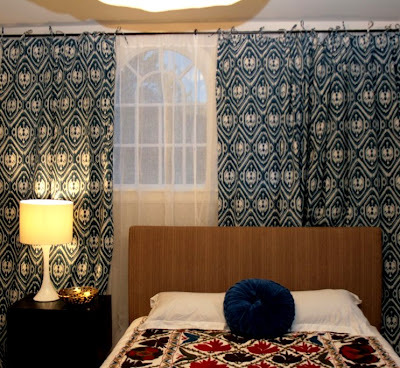 We couldn’t justify the costs of the Weinrib fabric for this room, so the ikat panels from Cassil really worked! Love them! We added sheer linen panels from West Elm underneath for layering and a little sunlight. The fab mid-century nightstand is from TINI, one of my favorite stores to shop at this year. Last year, I found myself constantly checking their online shop and I’m so glad they now have a showroom close-by! To find out more about the bed, artwork, and accessories visit Annie’s site for the full scoop. I will also be sharing a boy’s room in this same residence once all is finished up!